Here is a beautiful answer the Angels have given a Heart that asked how to pray. I so wish to learn how to pray, could you teach me how? “All answers are within you, in your choices, in your opening up, in your believing. Prayer - as you call it - is to share and manifest your belief with the Great Light. When a Heart asks for help while praying, expresses Its difficulties, sorrows, doubts, fears; in that moment, It has faith. Open your heart to Me, confide your fears to Me, your uncertainties, your confusion, your deficiencies, your suffering. Do share every feeling you hold in your heart with Me, with the same candour as children, without any limit, without any additional thought or fear: this is prayer. Alongside this kind of prayer, there is another one, another moment considered prayer, it is what you call meditation, which is creating silence within your heart so that you may hear the voice of your Soul, so that you may hear the answers of your Angel, the help of the Great Light. Imagine you are with someone you trust, and with that person you share your doubts, your fears, your struggles, your reservations: this is prayer. However, to receive help, then you need to listen to what she may suggest to you, her piece of advice. We talk to the heart, the Great Light talks to the heart when everything is silent, when everything is silence and the mind has fallen asleep. With all my heart I wish for you to live moments during which you have nothing to ask for because your heart is fulfilled, and the Soul is at peace. During those moments you are simply listening to the words coming from your Angel, the sweetest music to your heart. The only reason you are there is to feel the Love of your Angel, of the Great Light. Both are nurturing your heart and Soul. When you experience these moments of bliss, the heart is filled with gratitude and so much Love, it feels like it’s overflowing. Then the wish to express gratitude for what you have, what surrounds you, what you feel in your heart, who you are, the treasures your heart contains, is born. You will feel the desire to express all the Love you have for your Angel, the Universe, and all its Creatures. Show your Angel and the Great Light the thankfulness, the gratitude, and the Love: this is prayer, too. In my experience, this is the sweetest, most fulfilling form of prayer. Naturally, to be able to deeply connect with Angels and the Great Light, silence is necessary. Angels do know how difficult it is to create silence. We are used to the use of words, rivers of words, while at the same time we fear the absence of words, we fear silence. Often when we are with someone, we are always trying to keep the conversation alive or we even make an effort to do that. We forget that silence can give us comprehension far more than any word. Real silence demands us to distance the mind while we keep our heart completely free and candid. You can nevertheless begin to create silence; only then will you understand what is present in your heart that you should let go of or transcend. When in a state of silence, you can intuit what is necessary to do or not to do. In order to do that, some choices are necessary and require courage and strength, because we fear the truth that will surface within the silence. It is not necessary to look for the ideal conditions of the heart and mind to create silence, but attempt, nevertheless, to create silence, always, whatever the circumstances, whether we succeed or not. Through this kind of training, we will soon reach the point where we will fall in love with silence, we will feel it as a primary necessity, like a spring we tap into to quench our thirst, a place where we can rest, a tool to transform anything we hold in our heart that prevents the experience of joy, harmony and peace. To make things easier, Angels suggest to imagine we are entering a beautiful and bright house, Their home. A home where we can find shelter, we can quench our thirst, find nourishment, warmth, a place to rest, restore our heart, body, and Soul. Inside this special home, among quenching our thirst, eating, finding shelter and feeling protected, we can also grow with understanding, we can evolve intuitively, we can perceive what is within us, and everything that vibrates around us. 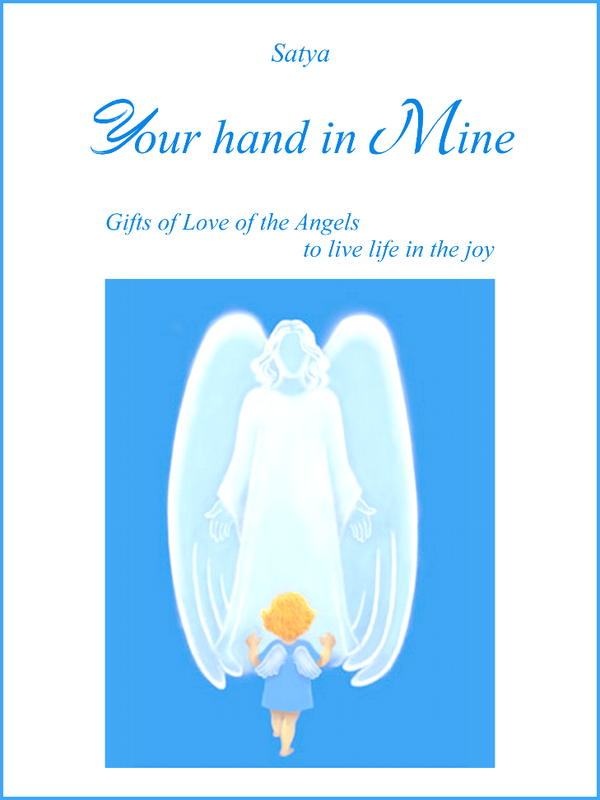 At this home we can feel the Love our Angels instil while we are there, we simply are, without doing anything, or asking for anything. No specific technique is needed, entering this house will suffice. Sit down, open your heart wide and let things happen. “Silence is a profound intimacy between you and Me, between you and Us, between you and the Great Light. It is simply taking a break, closing the door behind you and sitting down with Us, with Me, next to a candle light or under the Sun. Silence is letting go of the noise of the world, so that you may hear our music. It is letting go of the body, so you can feel Us with your Essence. It is letting go of the mind and letting the heart speak, to merge with the Soul. True silence is sweet intimacy. To reach this state of being, big things are not necessary. Just follow what connects you to the Universe: your heartbeat. Smile, and open up your intimacy so We may enter it. Silence is to perceive the heartbeat of the beloved, and it can only happen when we are there to hear it, when we are open to perceive it and enjoy it. It is all there, it is all there. Do not let a day go by without this intimacy, only with this practice can the heart be free from anxiety, with its gaze towards the Soul, the Light, the Love. Silence is a spring that can quench our thirst, it is food that can nourish us, it is a means to return to peace and allow Our peace to enter you. Could you help me learn how to create silence? “Follow your breathing, the wave that it creates, the circle it makes, while you focus on breathing Love and Light. Inhale Love, and exhale Love; inhale Light, and exhale Light. Pay attention to what you hear and feel, knowing that deep within you are taking in Light, Love; Our Light, Our Love. Pay attention to what happens to your body while it has been touched by the Love you carry within through your breathing, and that We are carrying around you. Get lost within the watching, the feeling, the perceiving. Remember it takes little effort but repeat it often. It is the quantity of your training to silence that will help you in getting to know the silence, living the silence, and loving the silence. Do it during the day, in as many places as possible. Practice. When you find yourself in the forest or you sit before the sea, surrender and create silence. This is how you will be able to create silence the longest, because you will feel the pleasure to stay there within that perception to grow, so you may perceive everything, get lost within the Whole. More than ever you will feel surrounded by an all-giving Love, and the kind of peace that carries everything. Remember that within the silence you can see earlier what will happen later. Within the silence you can make out ‘Who’ surrounds you with Love." Sometimes there is something inside of me that I do not understand but that prevents me from creating silence. What can I do? “Listen with increased attention to your breathing. Stop and observe the breathing; you will notice if there are tensions or anxiety within you. You will then be able to release them because the constrained breathing limits life. If you observe your breathing, you can look at what’s inside you, what is going on with you, and right there you can understand, learn, change and take steps to then rise. Within the silence We will speak more and the voice of the Soul will be louder. You will get to know the language of the Soul and the Universe. There you will experience profound peace." Sometimes I am afraid to create silence. Why is that? “Because when you create silence you find out what is inside you and that requires courage. Silence is not about stopping words, it is about halting the thoughts, distance from them, detach from them, certainly it is not about blocking them within you. The moment you distance your thoughts, you are looking at your heart, in your intimate self, and there you find out all that there is. When you have the courage to explore the depths of yourself and listen to what still has to be transformed, released, there you will also find aspects to love, discover, re-discover, experience. There you will find your beauty, your treasure, yourself. Then you understand with the Soul, you feel with your heart, you understand the why of a feeling, a situation, the reason for a situation you experience, you are experiencing, or will experience. You comprehend the action you have yet to take, the steps you need to take. That is why sometimes we fear creating silence. However, if you give room to silence, it will allow you to find yourself anew, restore, and regenerate. During the time you are with Us, We can instil inside you the strength to experience anything, accomplish anything, that is the courage to face any situation with enthusiasm to continue the journey. Love the silence, do not fear it. We fear because we believe that we are about to enter sadness, when on the contrary, silence allows us to enter joy, in profound contact with joy, Love, and the Light. In the silence so many thoughts arise. “Let them flow, do not create a sense of guilt when they arise: the more you align to silence, the least thoughts will surface and the faster they will come to pass. The longer you remain silent, the less room specific wishes will have and you will reach a point when you will be so connected to the Whole, that you will have no wish at all. You will have surrendered completely, and completely merged with the Whole. Inside you, there will only be playing the music of Love, of our words, and the words of your Soul. All you need is practice. During those moments feel Me next to you." “All it takes is mere moments with Us, to take you back to your initial state of that morning. Silence can be a moment of great intimacy with Us, of a very intense and long kind, but it can also be a moment of brief enlightenment when the attention is turned towards the Soul where one can feel unity with the Sky, and with the Light. These moments will not distract you from your daily life, rather they will allow you to experience it with all the intensity possible. They are just moments, but they are necessary during your entire routine, because when you feel this unity with the Light, remembering that you are a Luminous Soul will allow you to overcome anything, it allows you to manifest the Essence until you will feel you are simply a Soul united to the Light. In the beginning, make sure one full hour does not pass without these moments, then you can reduce the time increasingly until you remain constantly connected. When you do that, you create a thought that moves a certain type of energy, and you know that when we wish to remember something that is of the utmost importance, we do remember it. There reside many emotions, there reside many fears, but it is not anger, child. It is not by accident we help you experience your opposites. The more intensely you will play the game, sing, dance, the more intensely you will succeed in perceiving new chants, new languages, and you will be able to express yourself in a new dance. Until the Whole has yet to be fully expressed, the heart cannot be totally empty. You will not be able to speak the new language, and within the new language you will learn more languages still, because you will learn to speak a new language, and you will hear, understand, many other languages. It is not the silence you know, but a new expression from which many new dances, chants, and words come. When you achieve that, your happiness will be uninterrupted because right there are the true dances, the true chants, the true expressions. At the time when you will near the silence, look with your heart, certainly not with your mind, for musical notes, look for chants that are familiar with you, look for words you have forgotten. With this attitude, you will experience the inevitable enthusiasm coming from the adventure to discover the new. There will be joy for the new, the thrill that the new, when so intense, can give. The new will be so intense it will be inebriating, and in that state you will experience the magic. If you approach silence with the idea that you will suffocate words, chants, emotions, you will never know true silence, because what is suffocated is repressed. It yells and yells louder, it pushes and pushes stronger. When you use words, expressions, emotions, and chants with Love, with joy, for a while, to increase your knowledge, to manifest, to express different words, chants, dances, songs, expressions, then what you have laid down for a while will fall asleep, certainly it will at some point awaken and take its place. At that point the new will be so attractive to you, in such a strong way, in such an intense way, that you will forget the place where you have laid down what you now know, and when that will awaken again, you will no longer feel it. It is difficult to understand for you now, however, as you go through it, you will understand everything more easily, you know that. It is through experimenting that you will receive help to know, it is through living that you can intuit real life more. Share your difficulties then and you will receive help. We can each have what limits the lightness of the heart or makes us suffer. The suffering comes from different journeys. In each of these journeys we each live different experiences, and that is why compassion is indispensable. What is easy for one can be difficult to another; what can unsettle one can make another happy. That is why everything that upsets or delight the heart must be shared, because that is how great help comes to us, that is how we can dispense great help. For some to reconnect to silence, live the silence, what you now know naturally because it is not yet true silence can cause great fears, great reactions, or cause wishing to run away, because they feel that what is suffocated may come up, emerge, because they perceive that explosions can take place there. Silence can upset, can make us react or run away, because there it remembers, it recognizes, it reconnects us with an Ancient aspect that is very luminous, very big, but an Ancient that in many journeys has caused suffering, not in its natural expression (because the expression of Light is never cause for upset, but can only bring great joy, great ecstasy), but because someone has suffocated Love, Light, or even in some cases, life itself. Well then, now you can understand the many reasons for attraction or rejection, push or resistance, emotion for the new experience or desire to retreat and run away. When you share all of this, and hold My hand, and your heart will be connected to Mine, we will only create enthusiasm for a new experience, that will take you to know the new, remember the Ancient. There will only be the joy typical of all great adventures. You know that when we travel happy to experience and adventure, all challenges can be overcome with a smile. So now you know it was not anger that you felt, but something else entirely. Later on we will give you more understanding of what can still emerge. When you feel great difficulty, or reactions, pay even more attention to what is behind it and allow it all to come up. I love dancing a lot and I am under the impression that dancing takes me closer to You than silence. “When you dance, you experience that necessary lightness to live life, to live the daily routine; you feel that everything is dance, everything is movement, and in this state you create room for enthusiasm, you create space for the necessary strength to fight when necessary. You feel that dancing and playing are indispensable to go through life with the right attitude, to experience life correctly. When within you there is a block, when you dance, everything starts moving again and that heaviness vanishes. Dance, dance, dance…at home, on the grass, at the beach, and when you feel tired stop dancing, create silence to feel your body, to feel what the body wants to communicate to you after having danced. Listen to what the heart wants to tell you after having danced. Then you will love the silence, you will feel like sitting down and listening to your body, your heart, your Soul, and Us. Silence meets the joy in your heart and there words begin to flow, as well as sounds, music, and emotions. Dance, play, and then experience the silence as if it were a dance, as if it were a game. Love the silence knowing that it truly is just a game, a dance; the absolute dance because there vibrates an infinite amount of things inside and around you. You are looking for your balance: the dance, the game, and a lot of silence will help you reach it faster and faster. You will give the fair value to everything you will experience, because you will feel like a dancer in the dance of life, a player in the game of life. This will encourage enthusiasm and joy. Your heart must remain light whatever happens. Will silence bring me the kind of peace I am looking for? “Within the silence you will allow a new peace to enter your heart, your body, and your Soul. Peace brings Light, which brings to the Light the peace that brings Love, which brings to the Love the peace that brings strength, which brings the strength of Being. “It is being there, simply being there, getting lost in the sky, getting lost at sea, looking at a tree and closing your eyes to see nothing, but to perceive everything. Meditation is about becoming the sky, becoming the sea, becoming the earth, the Sun, a star, a tree: it is merging with the Whole and becoming that Whole, it is getting lost in the Whole, to find the Whole. What does it mean to be channels of Light? “Love and you will be surrounded by Love, let your Light shine and allow Our Light to envelop you. Those Who trust Us completely will experience immense joy, and new emotions. Vibrate with Love, and We will vibrate in you. The vibrations of joy you will perceive in your heart when you see the Light shine out of those people whose heart you have helped open up, when you feel their emotions, their joy, when you witness their transformation, you will experience new thrills, great and intense ones. This is what it means to be Our channel: it is about feeling you are nothing but a means of Light, of Love, it is about feeling the joy of Universal Paternity, and of Universal Maternity. I dreamt you were coming into me and I felt things words cannot convey. I would love to experience that again. Would you help me? “That can only happen for just a few moments now because there are many limitations of the physical body, because the merging with Us is not uninterrupted, intense and total, but it could happen in the future for a much longer period of time, forever, uninterruptedly. What you have experienced is a result of you merging with yourself, when you meet yourself in the depth of it, when you make more room for Me, for your Essence. This happens when you fall in love with Love, with the Light, with Us, and you allow for the merging that Love causes. You know you had a taste of those delicacies and now you know they exist. Now you can better understand why we want to push you towards them, towards the ecstasy. Create more of these moments where you move within yourself, you enter those depths and, there, get lost. Create more of these moments of merging with the Sky and the Earth, with the flowers and the trees, with the Whole that surrounds you, so as to allow it to enter your being, and merge with it. Sweet Luminous Soul, in the silence you will truly find everything you have been looking for. What you think is now necessary, important, will vanish and you will feel it in a completely different way. In the silence you will experience great joy, you will find great Love, you will experience great emotions, because in the silence the Soul will merge with the Love, the Light, and you will feel you are coming back ‘Home’. Create silence, meditate, pray, feel yourself enter the ‘Home’ of your Angels and you will truly feel home, safe and deeply loved. You can achieve this in your own room, on the beach, in a forest, on a field. Every place will give you different vibrations of a different intensity. Whatever the place, feel yourself enter a home where you can find everything you are looking for, where you will find rest for your heart, for your body, for your Soul, where you will find infinite peace, and total harmony with the Universe…and so it will be. Specific techniques are not necessary: enter this home and take a seat, enter and feel you are taking your Soul to your Angel, to the Great Light, to allow Him to love you, to show Him your love for Him, to allow the Great Light to surround you. Sit down simply for the pleasure of being with your Angel, with the Great Light, and your heart will be fulfilled. When you create silence, do not try to see or hear your Angel. You might hear Him, you might see Him, and this will bring great joy for it is beautiful. In any case you will feel great joy and infinite sweetness when you will surrender to the Essence of your Angel, to His Love: all of your Being will be fulfilled. Simply remain seated, in sweet anticipation, let yourself be taken by what your Angel has to give to you, knowing he will infuse you with what you need in that moment, in that day, and for the following one, and the days to come. Ask your Angel to infuse you with that and then allow Him to infuse you with everything. There will come a moment when you feel merged with your Angel, fused with the Great Light, fused with Whole, and you will experience ecstasy.